Released on 3″ CDR, January, 2010. Après la sélection 100% japonaise du bimestre dernier, Taâlem se tourne aujourd’hui vers les Etats-Unis dont sont originaires les trois artistes de cette série de sorties. Cela devient une habitude de l’écrire, mais une fois encore, cette nouvelle série de CD-Rs s’avère être une totale réussite, que tous les amateurs de musiques aventureuses se doivent de posséder dans leur discothèque. Even though I don’t dare to locate this precious 3” CDr within the recent string of posthumous Celer releases, what I can do is point out how great it is. The title track, obviously the only one here, stretches the format’s limits to the max, clocking in at just under 23 minutes. I’m not usually one for shimmering, ambient drones(capes) but this husband-and-wife duo really did it right. Using a variety of string instruments with tape sound, samples and field recordings, “All At Once Is What Eternity Is” transports the listener over bizarre glaciers of rugged landscapes before, after some 13 minutes, a sudden break washes over the composition like sudden rain. Some spoken word samples ensue before the track builds again, via floating female melodies, towards a blissful anti-climax. It is an absorbing, elevating listening experience, and as such might be discarded as somewhat high-strung by some or in some situations. But while this certainly is not a release for each and every situation, it is so emotional that it is practically beyond reach. “All At Once Is What Eternity Is” has been out for a few months but it is still available from the label. Qintessential Celer, the three-inch release, All At Once Is What Eternity Is, is twenty-three minutes of field recordings of bell chimes tinkling in the wind and assorted rustlings alongside strings and shimmering drones. Time-suspending as always, the long-form setting (recorded in October 2007) gradually finds the reverberant drone dominating and the natural sounds vanishing—until they return even more forcefully in the form of hammering sounds that suggest the building of some wooden structure. As per usual in the Celer universe, abstract and real-world sounds intermingle, with the one moving to the forefront for a brief episode before ceding the spot to the other for its own brief spell. The recording isn’t unlike what we’ve heard before from Celer but it’s transporting nevertheless. What Drone Records does with 7″s, does Taalem with 3″CDR releases. Quite a success and getting more and more great names added to the series. People that we know otherwise from the real CD releases, which aren’t afraid to put something out on a 3″CDR. 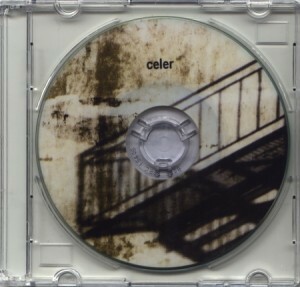 Celer for instance gained quite a reputation in a short time span. What I didn’t know about Celer is that Danielle Baquet-Long, one half of Celer, passed away in July 2009 of heart failure. Since then no new works are created, and all works that are released now, are from the duo of Will Long and Danielle Baquet-Long, recorded before that. ‘All At Once Is What Eternity Is’ is a very fine piece, a signature Celer piece. Meandering drones, with some acoustic sounds in the early parts of the piece. Maybe the sound of crop fields in the wind, along with some bells and chimes. An excellent piece of music.